OLD PARKED CARS. : 1951 Chevrolet Styleline. Looks like a rabbit about to hop. Wow. Once so common that they scarcely were worthy of a second look. Now rare enough that it just looks kind of odd. i took these photos on july 17, 2012 but never got around to posting them because, i think, i didn't like the crooked profile shot. there was a car in the way, and my lens wasn't wide enough at the time, and i always intended to get back and re-document it. funny, 'cause it's in a neighborhood i pass through frequently, but it's a neighborhood i only pass through when i'm very very short on time, and it's about five or 10 blocks out of my way--just off the beaten path enough that i'm pretty sure i've never made it all the way back to find out if it's even still there. but if i do ever get the chance, i really want to get a nice, square profile shot. 'cause i like this car. 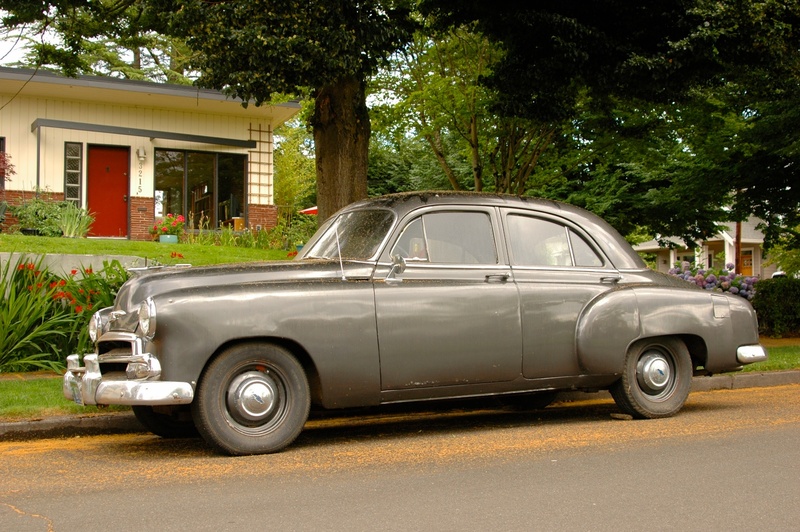 i kind of want a ponton or fintail, but this would probably be a much less expensively serviced car. OMG!!! I'm home at last! My Uncle Claude owned a '52 model very close to this one. Of OPC! Don, I hope you see this! Simplicity at it's finest. Beautiful! To me, these are so much more iconic/representative of the 50's than the ubiquitous 57 Belairs and such. 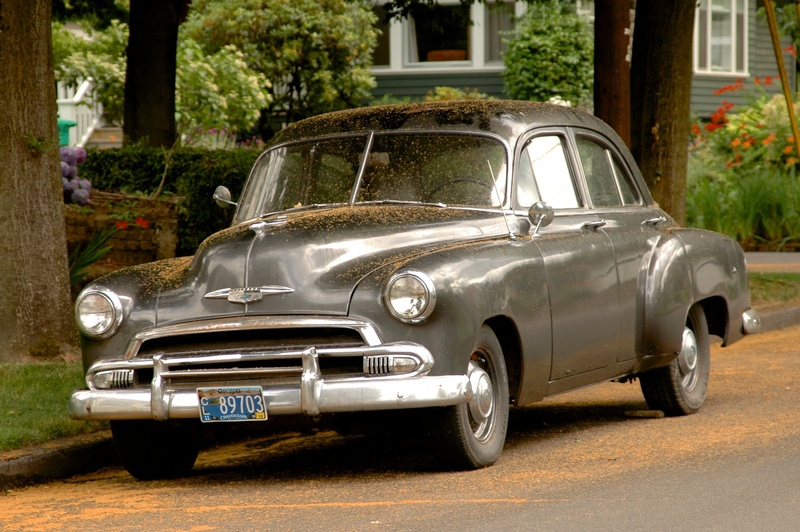 This car embodies the decade of the 50's! WoW! Thanks, Cap'n, for alerting me to this one! this great find! It really made my day! The 3rd pic really does look like a period shot. Also, this definitely represents the 50's more than an over-restored '57 Bel Air. hot summer day in 1971. I kept the car a few years before trading it to a friend. I saw it in '86 before my wife and I moved to Florida. Man do I miss those days! 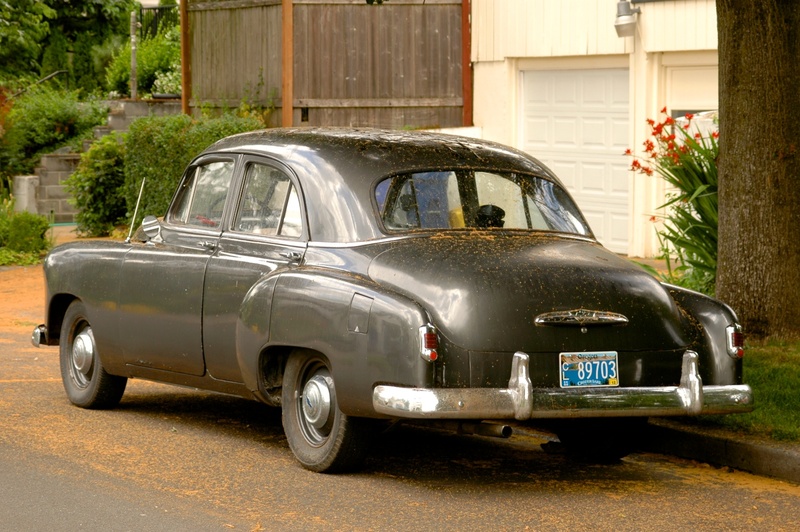 These old wonderful Chevs were overbuilt and very good quality cars.I had a nice and mostly original Styeline Deluxe sedan, 50,000 plus miles and left the factory finished in Mayland Black.....had to sell it a few years back. I'm determined to find another one day soon.....maybe this time one finished in Fathom Green. Ha Ha Ha! !